Critics hated this movie when it first saw theatrical release. Pauline Kael said it was a "monumentally unimaginative movie." "A disaster." Andrew Sarris in The Village Voice called it a "disaster." Stanley Kauffman in The New Republic simply labeled it "dull." Audiences however - particularly hippies high on acid - dug the psychedelic special effects scene at the end and made it a box office hit. Years later, one would be hard pressed for a critic who admits to disliking this film. It has made the so-called "canon" of critics' favorite films. But how does this film look today, almost 30 years later, to audiences weaned on the special effects wizardry of Star Wars and its ilk? Except for perhaps a midnight showing at some obscure cult cinema, audiences are also unlikely to see the film as it is supposed to be seen: on the BIG screen. No, it doesn't look as good on video or television as it should. As far as special effects go, it pales in comparison to Star Wars and many films made afterwards. Sure, some of the Sixties fashions look terribly dated. Okay, there are some terribly slow moving bits that will drive audiences crazy. Is it a good movie? Of course! 2001 has survived for the same reason it made such a splash back in the late 1960s: its bewildering and willfully obscure screenplay. The story (or lack thereof - depending on whether you liked the film or not) drove critics to distraction. What is Kubrick trying to say? What is the message? Who knows? But this is the kind of movie that will give audiences plenty to talk about afterwards - something few of today's formulaic films can manage. For this alone it is worth seeing. Entire books by various academics and film critics have been written about this movie. Try doing that with most of today's movies. 2001 is pure unadulterated sci-fi and there's nothing like it and probably never will be again . . . and that includes 2010, the 1984 sequel to it! Read 2001 - 30 Years On. 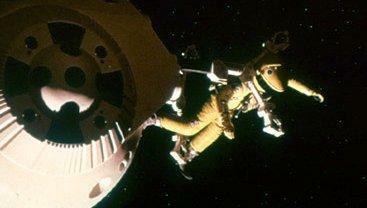 Read our review of 2001: A Space Odyssey on DVD. Read an extended review of 2001: A Space Odyssey.